Korea Marketing Association initiated the Korea Marketing Committee. The former CEO of SK Planet, Jinwoo Seo was inducted into the first chairman. 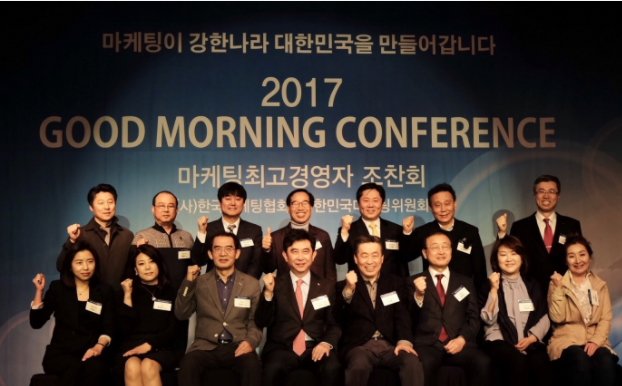 The 2017 44th Good Morning Conference was held as a part of Global Marketing Conference. In the 44th Good Morning Conference where about 150 people of CEOs and Executives from member companies attended, Korea Marketing Association inducted Jinwoo Seo into the first chairman of Korea Marketing Committee. Korea Marketing Committee is the committee where CEOs from market leading companies gathered with the slogan ‘Making Korea the nation with strong marketing power.’ And it was officially inaugurated on 2017 March the 17th. Jinwoo Seo who was inducted into the first chairman is a chairman of SK SUPEX Council and was former CEO of SK communication and SK planet. From now on, as a Marketing CEO group which represents Korea, Korea Marketing Committee will be formed with 6 subcommittees: marketing subcommittee, Korea-China marketing subcommittee, hosting breakfast meeting subcommittee, member exchange subcommittee, entrepreneurship subcommittee, marketing research subcommittee. And will do various activities in order to improve the national competitive power through marketing. Jinwoo Seo, the chairman of Korea Marketing Committee said “As the first chairman of Korea Marketing Committee, I will try my best for the role of strengthening the marketing power of Korea.